Your chance to create a factory-customized model modified to match your personal taste. Select your components and we’ll create it for you. Go from purchase to playing in 30 days. Sounds great, right? Build your dream guitar online, a one of a kind instrument that’s as unique as you are, right? Right from the start, you only have the choice of two guitar styles (Telecaster and Stratocaster) and two basses (Precision and Jazz) – Fender’s most popular instruments. Want a Jazzmaster? Sorry, no. Mustang? Nope. Tele Bass? Can’t help you. Binding around the body? Custom colors? If you want any of those, you can always head over to the Fender Custom Shop – but bring your checkbook, because that’ll really cost you. – ‘American Series’ pickups, or the more expensive ‘Texas Special’ set – again, already in stock. So I decided to give it a spin and ‘build’ a guitar and see what it would set me back. I chose a Telecaster body in Alpine White, parchment pickguard, standard bridge and tuners, maple neck. I went with the cheaper options for everything to get an idea of where the lower end of the pricing would be, and this relatively nondescript Tele with no special anything priced out at $1699. 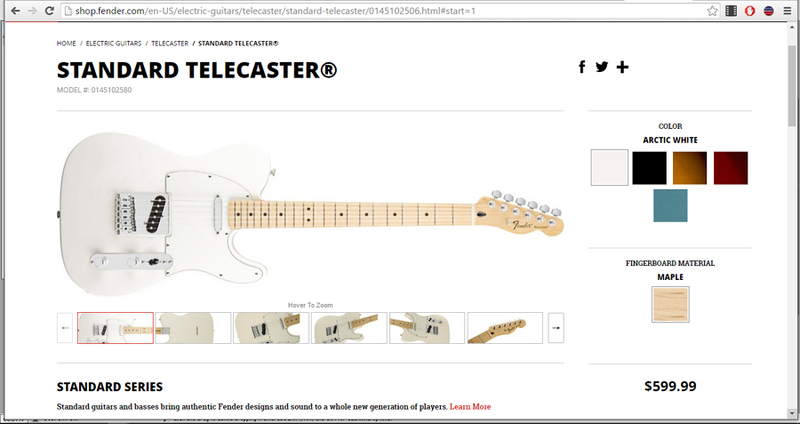 Then I had a thought – what would a comparably-equipped Fender Tele cost from Fender’s mass production site? I went looking for a Standard Tele, Alpine White, parchment pickguard, Maple neck, with average bridge, tuners and pickups – and found quite a difference. This one cost $599. Okay – to be fair, the Mod Shop Tele used slightly higher-end components than the Standard – ‘American Series’ pickups and bridge as opposed to just ‘Telecaster’ components on the Standard. But the body, neck and tuners were the same. But the price difference for upgraded pickups and bridge adds up to nearly $1100! 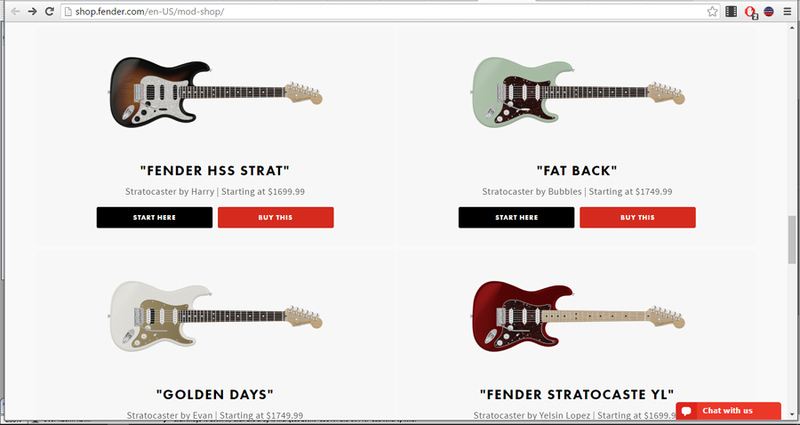 Fender’s ‘Mod Shop’ is really nothing more than an animated order form for guitars that you can just as easily buy from Fender’s already existing stock, with the angle that it’s ‘your’ instrument, with features unique to you. But even that is a bogus claim, because once you ‘build’ your guitar and plunk down your $1699 (and up! ), Fender apparently reserves the right to sell your ‘unique’ design to those who don’t feel like playing with the builder! In sum – the ‘Mod Shop’ will sell you a guitar with limited finish, pickup and hardware options for a pretty inflated price, and then turn around and sell that same ‘unique’ guitar to anyone else who happens to like ‘your’ design! Full Disclosure: I understand the desire for guitarists to have a unique instrument – I’ve built and finished nearly a dozen guitars over the past few years. A guitar is an aesthetic statement as well as a means to make lots of noise. I get that. But there are so many options out there for guitar bodies, necks and pickups (much of it licensed by Fender), you could conceivably buy non-branded parts and build a truly unique guitar for hundreds of dollars less. I know, I’ve done that. 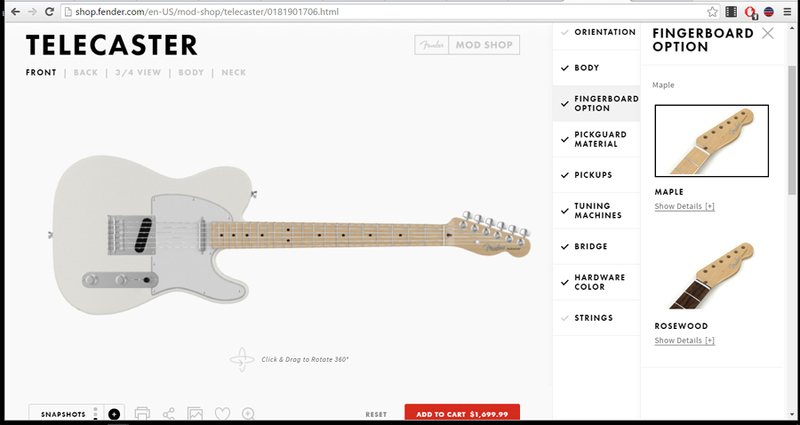 But I’ve got to hand it to Fender. They figured out a way to take existing stock and package it in a way that a lot of people will end up paying a lot more for a guitar that they could have probably driven to Guitar Center and found hanging on the wall. Very clever. But I have to wonder what Leo would think about this.